Mitigation is the effort to reduce loss of life and property by lessening the impact of disasters. Mitigation is taking action now - before the next disaster - to reduce human and financial consequences later (analyzing risk, reducing risk, insuring against risk). Effective mitigation requires that we all understand local risks, address the hard choices, and invest in the long-term community well-being. Without mitigation actions, we jeopardize of our safety, financial security, and self-reliance. 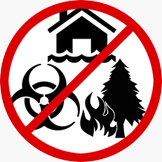 The Disaster Mitigation Act of 2000 requires all local, county, tribal and state governments to develop a multi-hazard mitigation plan for their respective jurisdiction in order to be eligible to receive certain hazard mitigation and public assistance funds to reduce long-term risk to life and property. In 2005, Pinal County and its local jurisdictions joined together and developed the Pinal County Multi-Jurisdictional Hazard Mitigation Plan. In November 2010, this plan received approval from the Federal Emergency Management Agency (FEMA). On July 12, 2017, an update of this plan was officially adopted by the Pinal County Board of Supervisors, and received approval from FEMA on August 18, 2017." The purpose of mitigation planning is to identify policies and actions that can be implemented over the long term to reduce risk and future losses. Mitigation Plans form the foundation for a community's long-term strategy to reduce disaster losses and break the cycle of disaster damage, reconstruction, and repeated damage. The planning process is as important as the plan itself. It creates a framework for risk based decision making to reduce damages to lives, property, and the economy from future disasters.